Did you guys see last week’s post about the Most Commonly Used Medications in Assisted Reproductive Technology (ART)? It was a doozy! But well worth the read if you’re just getting started in the world of ART! Today’s topic? Understanding the RISKS associated with ART! 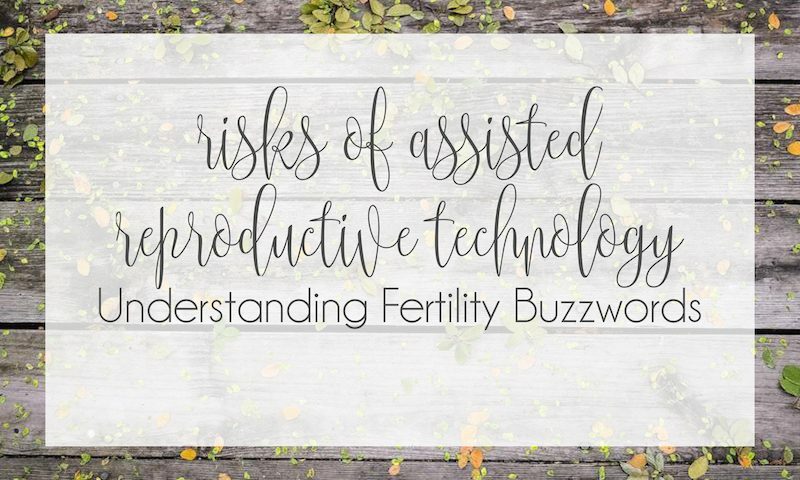 Don’t forget to check back next week for the conclusion of my Understanding Fertility Buzzwords Blog Series, where I’ll be covering how to PREPARE for the Assisted Reproductive Technology! Spoiler Alert – it’s how you and I can work together :). The use of ART has increased dramatically worldwide and has made pregnancy possible for many couples. Did you know that in 2012, 1.5% of all infants were conceived using ART?! Although most pregnancies conceived by ART have healthy outcomes, as with any medically assisted technology, there are risks associated with ART. The primary risks include infection, multiple pregnancy, Ovarian Hyperstimulation Syndrome (OHSS), birth defects, and emotional impacts. Let’s take a deeper look into each of these risks. Retrieval of eggs for In Vitro Fertilization (IVF) and insertion of sperm for Intrauterine Insemination (IUI) are both medical procedures that have a (small) risk of infection associated with them. Removing eggs through an aspirating needle entails a slight risk of bleeding, infection, and damage to the bowel, bladder, or a blood vessel. This is true whether the physician uses laparoscopy or ultrasound to guide the needle. Less than 1 patient in 1,000 will require major surgery to repair damage from complications of the egg retrieval procedure. Please note that I say this is a SMALL risk! Medical procedures have improved leaps and bounds from when they were first introduced, and today’s surgical hygiene means that cases of infection are rare. Did you know that over the last 4 decades, twin births nearly doubled? Triplet and higher-order births quadrupled! This increasing trend coincided with the introduction of fertility treatments such as ovulation induction, ovarian stimulation, and in vitro fertilization. Multiple births – the delivery of twins, triplets, or more – is common with fertility treatments. During the use of assisted reproductive technology (ART) – such as in vitro fertilization (IVF) – multiple births primarily result from transfer of more than one embryo during the procedure. Although some patients would consider twins a happy result, there are many problems associated with multiple births, and problems become progressively more severe and common with triplets and each additional fetus thereafter. Women carrying a multiple pregnancy may need to spend weeks – or even months – in bed or in the hospital in an attempt to delay preterm delivery. The risk of preterm delivery in multiple pregnancies is high, and babies may be born too early to survive. Premature babies require prolonged and intensive care and risk lifelong handicaps due to premature birth. Fortunately, ART practices are improving – over the past decade, fewer embryos are being transferred during ART, resulting in fewer multiple births. Ovarian stimulation (used in IVF, IUI, and egg donation) carries a risk of hyperstimulation, where the ovaries become swollen and painful. Up to 30% of women undergoing ovarian stimulation have a mild case of OHSS. Symptoms of OHSS include: fluid build up in the abdominal cavity and chest, feeling bloated, nauseated, and vomiting or lack of appetite. In moderate OHSS, women develop or accumulate fluid within the abdominal cavity, and gastrointestinal symptoms may occur. These women are monitored closely, but generally do very well with simple outpatient management. The condition tends to resolve without intervention unless pregnancy occurs, in which case recovery may be delayed for several weeks. Up to 2% of women develop severe OHSS. Symptoms of severe OHSS include: excessive weight gain, fluid accumulation in the abdomen and chest, electrolyte abnormalities, over-concentration of the blood, and, in rare cases, the development of blood clots, and kidney failure. It may be medically necessary to drain fluid from the abdomen with a needle if breathing becomes difficult. Women with severe OHSS require hospitalization until the symptoms improve. If pregnancy occurs, OHSS can worsen. Occasionally, termination of pregnancy must be considered in the most severe cases. There have been various incomplete studies that have linked ART with birth defects. Recently, the CDC studied more than 4 million infants and found that single infants conceived using ART were 40% more likely to have a non-chromosomal birth defect (such as cleft lip and/or palate or a congenital heart defect) compared with all other singleton births. HOWEVER because this study did not account for some factors related to infertility that might explain the observed increases in risk for birth defects. More research is needed to confirm a link between ART and birth defects. The prevalence of non-chromosomal birth defects was slightly increased for women with a diagnosis of ovulation disorder – such as polycystic ovary syndrome (PCOS) – when assisted hatching was used. Another HOWEVER here – this association may be connected because of factors that could not be assessed – such as embryo quality and undiagnosed diabetes. The most common birth “defects” – which are more complications than defects – associated with ART are preterm birth and low birth rate. Truthfully though, this is a risk for ALL pregnancy! This is something that tends to be overlooked and forgotten about. ART is not cheap. As the technology improves, the procedures are becoming more affordable (thankfully!) but, as we all know, financial hardship can lead to emotional stress. There may be emotional impacts upon recipients of ART, as well as impacts upon the children born as a result of donor conception, and donors of eggs, sperm and embryos. When surrogacy is used, long term emotional impacts upon women who relinquish the children, or impacts upon children (both those that live with their mother, and those that are relinquished), are possible. I encourage all of my clients looking into ART therapies to do the research first! Talk to a counselor, a doctor, a friend who has gone through it before. Know the risks – emotional, financial, physical – before embarking on the assisted journey to motherhood. The world of ART is a complication one. That’s where I come in! Read more about how I help women get pregnant (naturally or through ART therapies! ), or schedule an Initial Fertility Assessment to work with me directly. Have you considered ART therapies before? What convinced you to proceed or choose to not move forward?